The entrepreneurship part of my SAE includes running a Simmental Cow/Calf Operation with my family as well as a 20-head Boer goat herd. I have also shown and sold steers at the fair since I was eight. In addition, my placement involves working at the local MFA Agri-Service helping customers get the feed they need for their animals and the seed they need for their fields. I hope to help members get out of their comfort zones and discover new parts of agriculture and the FFA. I want to help every member reach their highest potential, to learn new things about themselves, and to be confident in their own abilities. I have grown up on a family farm and have had my roots and boots in agriculture ever since I was born, and my dad was the driving force behind that. My dad was always my inspiration and the one who drove me to be my best, and then do a little better than that. My father has taught me more life lessons than I could ever remember like, “If you fall, get right back up.” He encouraged me, supported me, taught me, guided me, and above all, loved me. I can only hope that he is looking down on me and my family, still teaching us lessons and feeling proud. I will be attending the University of Missouri-Columbia to obtain a degree in animal sciences. After Mizzou, I hope to work in a job involving biotechnology and animal genetics. I have always been interested in the world of genetics and how things have come to be. With the future of agriculture more connected to technology than ever before, I am certain that biotechnology will help us gain insights into what we are producing and help the agriculture industry to move forward. If you ever happen to have the chance to see me write anything you will probably notice that I’m a lefty! Most people that I have grown up with don’t even know that I am left-handed. Being a lefty is a gift and a curse, anyone who is left-handed can feel my pain here with the right-handed desks we are forced to sit in! 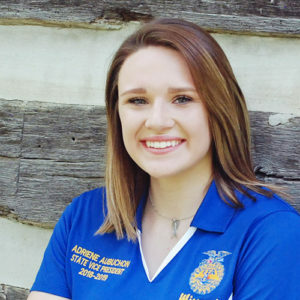 My advice to FFA members is to always, always, always be you. This is the most important thing you could ever do. Only one person in this whole world has the abilities that you have, so don’t deprive everyone of your talents by trying to be someone else. I’ve been in your shoes. I’ve tried to fit in and be someone I wasn’t. But I finally realized that I could accomplish more if I wasn’t focusing on being a completely different person. So can you. You have the skill set to do whatever you set your mind to. Go accomplish great things!